Has the Coalition set Labour an impossible task – to rescue politics from corruption? Yesterday’s article, DWP denials: They would kill you and call it ‘help’ received an unprecedented reaction – considering it was only intended to prepare the way for a larger discussion. In less than 12 hours the article went viral and galvanised many of you into vocal support, sharing your stories of government (and particularly DWP) ill-treatment and urging others to follow this blog – for which much gratitude is in order. Thanks to all concerned. The aim was to show how low politics and politicians have fallen in public estimation. The general consensus is that our politicians aren’t interested in us. They make promise after promise before elections – and the party (or parties) in office often set up tax breaks for sections of society their focus groups have told them are needed to secure a win. After they’ve got what they want, they don’t give a damn. Look at the Coalition. The consensus is that this is a failed government. That it has broken one promise after another. That its ministers are liars and its Prime Minister is the worst charlatan of the lot. That its rallying-call, “We’re all in it together”, refers only to Conservative and Liberal Democrat Members of Parliament and their close friends in the most lucrative (and therefore richest) industries, along with the bankers (of course), and that they have all dug their noses deep into the trough and are (to mix metaphors) sucking us dry. Look at the way Mark Hoban employed his former employers to rubber-stamp the DWP’s new plans for the Work Capability Assessment. In short: That the Coalition government is the most incompetent and corrupt administration to blight the United Kingdom in living memory, and possibly the worst that this land has ever endured. We fear that these tin-pot tyrants are carrying out a eugenics programme to kill off people who have become sick or disabled; we fear that their economic policies are designed to put anyone less than upper-middle-class into the kind of debt that current wages will never permit them to pay off – a debt that can then be sold between fat-cat corporations who will hold the masses in actual – if not admitted – slavery; that they will dismantle this country’s institutions, handing over everything that is worth anything to their buddies in business, who will make us pay through the nose for services that our taxes ought to cover. And yet a recent poll suggests that we would prefer this corrupt gang of asset-stripping bandits to run the economy of the country (into the ground) rather than give Her Majesty’s Opposition, the Labour Party, an opportunity to restore the country’s fortunes. Are we all going schizoid? Are we really saying that, while we don’t believe the Conservatives and Liberal Democrats could organise a binge in a brewery without stealing the booze from us while we’re drinking it, we do believe them when they say the current economic nightmare was because Labour mismanaged the economy? Are we really saying that even though we all now know that George Osborne’s economic policy is nonsense, based on a theory that has been comprehensively rubbished, we’re all happy to give him and his miserable boss David Cameron the credit for the slight improvement in the UK’s economic fortunes that we have seen in recent months? It was always going to improve at some point, and the current upturn is more likely to be part of that kind of cycle than anything Osborne has done. If we really are saying that, then we all need to put in claims for Employment and Support Allowance, on grounds of mental instability! That’s not what’s going on, though. It seems far more likely that the general public is having a crisis of confidence. As a nation, we know what we’ve got is bad; we just don’t have confidence that we’ll get better if we put our support behind the Opposition. This is the Coalition’s one great success: It has damaged the reputation of politics and politicians so badly that nobody involved in that occupation can escape being labelled as corrupt, or liars, or worse. And Labour is doing far too little to fight that. A BBC article on the problems facing Labour states that the Coalition has sharpened up its messages on, among other things, welfare and immigration. The message is still the usual hogwash; the problem is that Labour has made no meaningful response. Her Majesty’s Opposition appears to have given up Opposing. Is this because the main political parties are now so similar that Labour is now supporting Coalition policies? That would make sense in the context of statements made before the summer recess by Ed Miliband and Ed Balls, in which Labour appeared to capitulate over welfare and the economy, even though the Coalition had lost all the major arguments. When they did that damned stupid thing in that damned stupid way, Vox Political was the first to say “watch their poll lead disappear” – and it has more than halved from 11 percentage points to five, according to The Guardian. This lackadaisical attitude from the Labour leadership has not gone unnoticed among the backbenchers and the grass roots, and the last few weeks has been notable for the rising chorus of dissent against Ed Miliband’s leadership. Some have described the Labour front bench as “Plastic Tories”. Even Shadow Health Secretary Andy Burnham took a pop, saying Labour needed to “shout louder” and produce attention-grabbing policies by next spring – or lose any chance of winning the 2015 election. Miliband’s response to that was to claim that Burnham was really saying the Labour Party was “setting out how we would change the country”. This is nonsense. He was saying that was what Labour needed to do, and Miliband rendered himself untrustworthy by suggesting otherwise. It is very hard to put your support – and your vote – behind somebody you don’t trust, who seems completely unable (or unwilling) to fight your oppressor on your behalf; in short, someone who seems just as corrupt as the government in power. 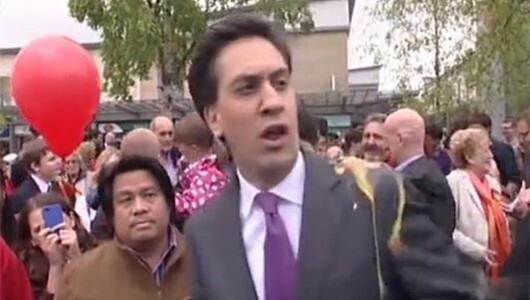 At the moment, Ed Miliband doesn’t stand for anything – so there’s no reason you should stand up for him. What, then, should Labour do? Easy. The party needs a clear, simple message that everybody can understand and get behind; one that members can support because it reflects Labour beliefs rather than whatever Coalition policy currently seems popular, and above all, one that comes from verifiable truth. He could take a leaf from Paul O’Grady’s book. In a clip on YouTube, the entertainer says: “We should be vocal in our fight against oppression. We should let them know that we are not taking these draconian cuts lightly! Labour needs more than that – but a commitment to protect those who have been most harmed by the Conservative and Liberal Democrat doomsday spree would at least be a start.